Initially it was the name that drew me to this wonder product! I love it, it reminds me of childhood books for some reason, also, Lemony Flutter smells like heaven, just like lemon sherbert sweets! I use this mainly for softening my cuticles but it's other uses include rubbing it over any dry bits of skin, elbows, feet etc, to soften up. 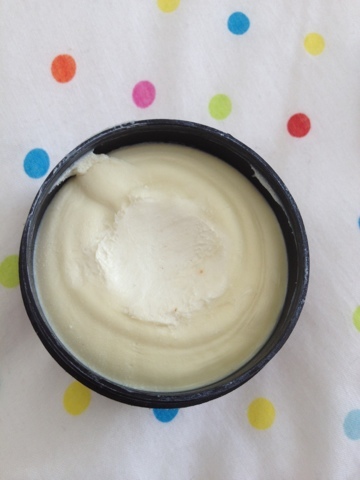 It's very thick and very moisturising, and slightly greasy but not necessarily in a bad way, I normally rub this on and then put on hand cream so that you're not left with greasy little nails! One of my friends thought this was a hand cream though and rubbed it all over her hands, I wouldn't reccomend becuase it is a little bit too greasy for that, but she did have super soft hands a few hours later so could be good for an intense treatment if you have dry hands! Lemony Fltter itself has lots of lovely natural ingredients as you'd expect from Lush, top ingredients are Beeswax, Shea Butter, Lemon Oil, but there are literally so many oils and lovely bits in this that I won't be able to fit them all into this post but check here for the full ingredients list. I bought a pot of this last summer and after using several times daily, a few months later it still looked hardly used so it will literally last for ages, I had to repurchase recently though because I left my last pot in a hotel in Nottingham on a work trip *sadface* It's great at softening cuticles and for eradicating dry skin around the nails, I carry mine around with me in my bag because I do use it about 10 times a day, it makes your nails look like you've just come out of a salon, I've also used as a lip balm when I couldn't find any in my bag and it worked great so it really is a multi purpose product. I picked mine up in my local Lush for £5.95 or you can order it online here! Have any of you guys used Lemony Flutter? 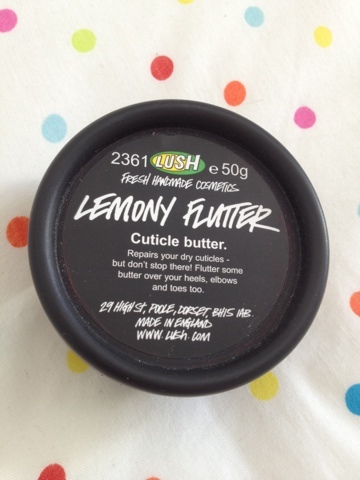 6 comments on "Lush Lemony Flutter Cuticle Butter"